THOUSAND OAKS, Calif. (AP) The Los Angeles Rams loaded up on experience on the defensive line and in the secondary with a series of audacious offseason acquisitions through trades and free-agent signings. At linebacker, however, the Rams are trending in the opposite direction. The youth movement becomes even more evident during offseason practices. Third-year linebacker Cory Littleton is calling plays for the first time after moving inside. Second-year outside linebacker Samson Ebukam was paired with rookie defensive end Justin Lawler to form the main pass rush tandem during a team period Tuesday, with rookies Trevon Young, John Franklin-Myers and Brian Womac seeing significant action behind them. It is a trade-off that seems to be working for head coach Sean McVay. ”We’ve really put them in some tough situations with how we’ve practiced, so it requires a lot of thinking on the move, some of the adjustments and things, especially just based on what the offense is presenting And I think they have handled it well, and I think we’ll have a better feel towards the end of the offseason program and them going into training camp,” McVay said. The Rams traded inside linebacker Alec Ogletree and edge rusher Robert Quinn during the offseason, and outside linebacker Connor Barwin remains a free agent. Ogletree led the team in tackles last season, and Quinn and Barwin combined for 13.5 of the Rams’ 48 sacks. In the hopes of filling some of those gaps, the Rams used four of their 11 picks on linebackers to add depth inside and outside. Special teams contributors Littleton and Bryce Hager will take on larger roles in the middle, and players from McVay’s first draft class in 2017 such as Ebukam and Ejuan Price are being asked to further ramp up their development in pressuring opposing quarterbacks. That inexperience could be what limits the potential for a defense that added defensive lineman Ndamukong Suh and cornerbacks Aqib Talib and Marcus Peters, but Littleton expects the linebackers to respond to the challenge. ”We’re all still developing, but by the time the season comes I feel we’ll all be ready and we can all show that we have more to offer than people might think,” said Littleton, who is getting the first chance to replace Ogletree in the middle. 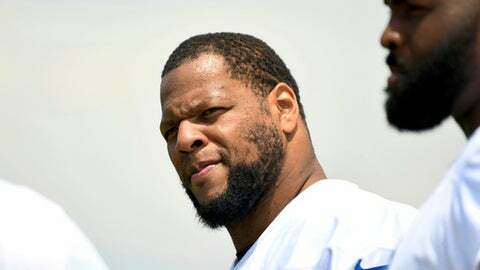 Suh is emphasizing the little details to his youthful teammates, but understand that they take time to be refined. Fellow veteran lineman Michael Brockers is stressing relentless effort on every play. Suh puts a priority on communication. For Littleton, the challenge to communicate is literal. He has never had to relay defensive signals before, and Littleton acknowledged that requirement of his new position is at odds with his reserved nature.